Your wedding represents one of the most important days of your life. 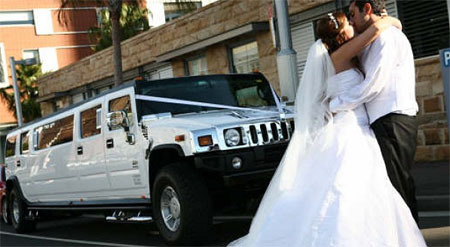 Every detail should be planned just right and this includes the selection of a wedding limousine service. Typical services that you will want to consider include transportation for the wedding party, a getaway car for the bride and groom and options for honeymoon travel. When researching wedding transportation choices, there are a few common questions that typically pop up. How far in advance should I look to reserve a wedding limousine? It’s typically recommended that you reserve your wedding limo 6-9 months in advance of your wedding date. This will allow you to coordinate your planning efforts and ensures that that your limo package will be available. It would be a shame to limit your selection of wedding limos so it’s always a good idea, if possible, to begin your research early. How much can I expect pay for my rental? Wedding limo rentals typically range from $200 – $400 and usually require a minimum rental time of 3 hours. Prices can vary depending upon your location and selecting exotic limousines such hummer limousines or SUV Limousines can cost considerably more money. Another factor that can influence the price of wedding transportation is the time of year your wedding is held. There is typically greater demand for limos in the spring due to it being a busy time for wedding and prom limos. This causes prices for reservations to rise as spring approaches. As mentioned, most limo companies require that the limo rental lasts for at least 3 hours. One reason for this is that the rental needs to cover pick-up, drop-off and the time in between during the ceremony and reception. Given that weddings can last longer than expected, it’s typically recommended to add an extra hour to the amount of time you expect the wedding limo service to cover. This will ensure that you have the necessary limo transportation for you and your guests at the conclusion of the ceremony without needing to pay expensive overtime fees. Is it necessary to get a signed contract? It is still a good idea to request a signed contract with the limo company you select. This protects you in the event that that the service you receive does not meet your expectations. Important components to include in the contract are the types of limos and package chosen, how long the limousine rentals last and what the overtime rates are for each vehicle. By planning in advance, you should be able to select a wedding limousine service that adds to the joy of your special day. By filling out our search form you can request free quotes to start your research process today. You will instantly be able to compare limo transportation options and get a head start with your planning so that selecting a limo service is the least of your concerns as your big day approaches.